I owe the success of tonight’s dinner entirely to magic of the Internet. I had to edit all day, so I needed a low-fuss but still appropriate-for-Friday meal. I had a whole farmers market chicken in the freezer, and I thought I remembered reading a blog post a while ago about a nice, simple way to roast one. Well, I dug through the hundreds of recipes I have saved on Delicious and found it: It was from the lovely blog Use Real Butter, and it was from nine months ago. All I can say is that if you find yourself with a chicken and not much prep time, this is the recipe for you. I left out the lemon, because I didn’t have one, but that’s the only change I made. 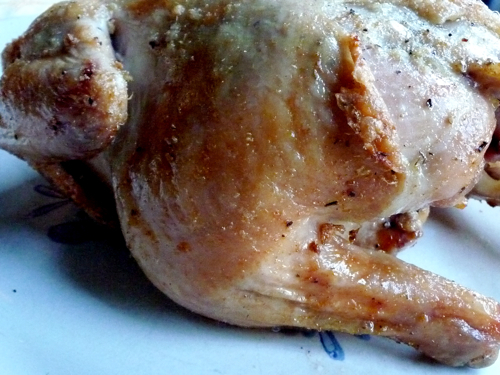 The chicken was moist and tender and flavorful, and the skin was incredible. Thank you for saving Friday dinner, Jen. I had some tomatoes sitting on the counter. Husband bought them at the supermarket last week because, as he said, “They looked good.” I don’t know what he was thinking. But hey, every other vegetable we’ve tried roasting has been delicious, so why not? The Food Network offered a recipe that conveniently used the same oven temperature as the chicken, and away we went. 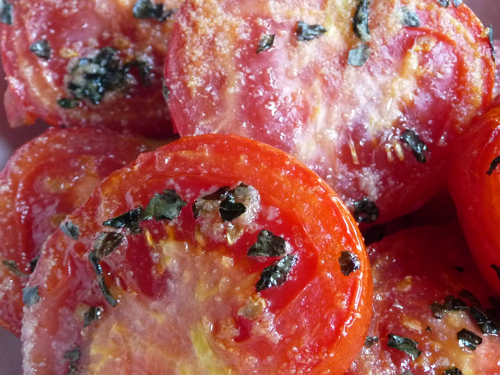 They were, in fact, delicious — they tasted like my pizza sauce, which is essentially what they were. Thank you, Food Network, whoever you may be. The bread this week was challah, also from a months-old blog post. This one came from Not Derby Pie, a blog that is chock full of great recipes and mouthwatering photos. I had a question about the instructions, which I posted as a comment, and Rivka answered me within a minute or so, both at the blog and by e-mail, just to be sure I got the answer. That’s service, and it was greatly appreciated. I hope I can be as helpful to a reader someday. The challah was excellent, even though I made the whole-wheat version. I’ve tried whole-wheat challah in the past, and I’ve never liked the results. 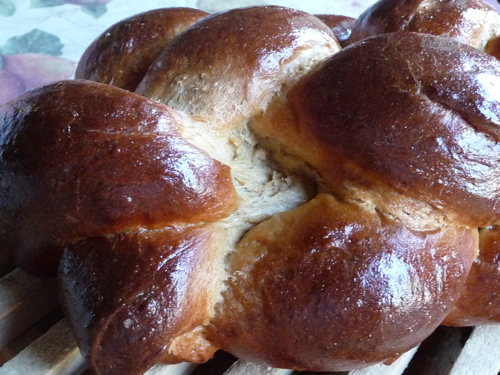 Rivka’s recipe is quick and easy and makes great bread, which is a rare combination. Thank you too, Rivka. And dessert was Blueberry–Sour Cream Ice Cream. But more on that on Tuesday. This entry was posted Friday, August 8th, 2008 at 9:16 pm	and is filed under Uncategorized. You can leave a response, or trackback from your own site.